In general terms, a resume is a summary of your past and present experiences. It gives an overview of who you are, your unique interests and talents and how you have developed them. Therefore, creating a resume that will adequately represent you during the college application process would be immensely helpful. Help you stand out by listing unique talents, interests, leadership roles, hobbies and awards/honors you have received. It also helps to highlight your passions/interests/initiatives and how you have developed them over the years. Start early (frosh/sophomore year) to keep you on track; it may seem like college is far away, but high school goes by quickly, and you will be confronted with college deadlines before you know it. Brainstorm with your parents to help you remember your activities and commitments to list on your resume. A resume will help you keep track of your activities throughout high school. When it comes time to complete college applications, the earlier activities you participated may have escaped your memory. Keeping track of your activities throughout your high school years and updating them (leadership positions, activity accomplishments, etc. ), as you go along will help make your college applications more considerable. Your resume will highlight your commitment and depth of interaction with your activities, which are two very important factors for college admissions counselors. Your resume will help you complete the Activities Section of your college application. You will have the information already completed on your resume, which will ensure a meticulously completed Activities Section. Your resume would be helpful to the teachers and guidance counselors who write your college recommendations. It would help them to better understand your accomplishments and the breadth of your commitments in relation to your academic achievements in class. 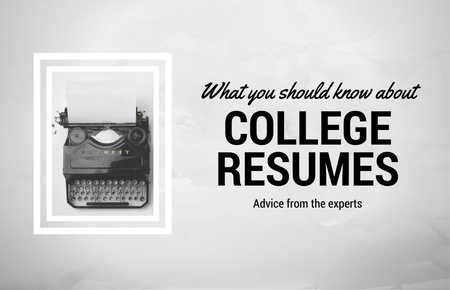 Many colleges ask for you to include a resume on their college applications. Bring your resume to a college interview (if allowed) to function as an icebreaker and/or a conversation starter. You would be familiar with the information on your resume so your interview would be enhanced. A resume could help in attaining internships and jobs that you apply to during high school and college. You would appear more professional and organized by having one. A resume could be used to brainstorm when deciding a unique essay topic, which would ultimately help you stand out in the college application process. Many scholarship applications ask for your list of activities and/or a resume. Your resume would help showcase your accomplishments. The most important thing to do on your resume is to organize the information so that it is easy to follow and understand. It shouldn’t be any longer than two pages, preferably one page. Use simple formats (you can design one yourself or easily find a format on the internet) and use either the Arial or Times New Roman Font. Don’t use multiple fonts. Spell out everything, particularly names of clubs/organizations that are specific to your high school and/or community. Ex: (SADD)-Students Against Destructive Decisions or (NHS)-National Honor Society. Explain what the local clubs or unique awards are too. List by order of importance, time commitment and leadership role. Don’t be wordy on your resume. Short descriptions that don’t use pronouns are acceptable. DON’T: ex: I participate and compete on the DECA club team for Marketing and Public Relations. DO: Participate and compete on DECA club team for Marketing and Public Relations. Use verbs to start your descriptions and to show action: ex: participate, create, organize, plan, contribute to, etc. Be consistent on your resume. Keep the titles of your activities the same throughout your resume: bold or capitalized, etc. Use proper grammar and punctuate consistently throughout your resume. Proofread, proofread and proofread again. Check for correct spelling (do not rely on spellcheck) grammar and punctuation. Make sure you continue to proofread before you submit. Keep track of the progression of your activities on your resume. Do not exaggerate or lie on your resume; you will be unable to undo the damage. Make sure your resume is accurate. Name, address, email, phone number. Don’t list your grades or courses. Colleges receive your official transcript when you apply. You should include school clubs, church/temple youth groups, community service at a homeless shelter, consistent support of a cause like cancer, marching band, theater, etc. Briefly describe the activity, what your role is, and the years you participated. Be especially careful to list and describe important leadership roles within these groups. Middle school is not considered part of your high school experience so don’t list anything from those years unless you have participated in an activity consistently throughout high school since middle school. Ex: Club soccer team, Destination Imagination, etc. List the sports you participate in at school and/or club, AAU or tournament teams. List a part-time job. Be sure to describe it briefly including your position and responsibilities. This includes a babysitting job as well. List academic, athletic or club awards; provide the name of the award with a brief description and the year you received it. Do not list an award that you had to pay for: “Who’s Who Among American High School Students” or other similar “awards” are not recognized by colleges/universities. List Lifeguard, CPR, First Aid, Babysitting Certification, Scuba, etc. along with the year(s) certified. Include your interests; knitting, computer programming, surfing, self-taught guitar, anything that shows who you are, what you do in your spare time and what you have to offer. Especially list any unusual and impressive skills and activities. Represent yourself in the best way possible by creating a resume that highlights your interests, talents, activities, and experience. It will be a great addition to your college application process, and you will be happy you put the time into creating it sooner than later. Create options for your future by taking the time to think about who you are, what you have to offer and putting those thoughts into action. Good luck and enjoy!